It’s Global Accessibility Awareness Day, which felt like a good day to explain how the accessibility features inside Swift Playgrounds and Apple solutions enable visually impaired people to code. It’s Global Accessibility Awareness Day, which felt like a good day to explain how the accessibility features inside Swift Playgrounds and Apple solutions are enabling visually impaired people to code. It has been just 63 days since we lost the genius of Professor Stephen Hawking. His life and his achievements show us the huge potential locked inside people who live with physical, visual, or motor skill challenges. Technology has the capacity to unlock human potential. That’s why accessibility inside the technologies — and the places — we rely on is a human right that benefits everybody. We use digital technology for everything, from paying bills to getting jobs to staying in contact with friends. That means access to such technologies is becoming integral to daily life. Accessibility empowers humans, enabling ideas, concepts, and achievements that may otherwise never enter the light. “The greatest enemy of knowledge is not ignorance, it is the illusion of knowledge.” - Stephen Hawking. We will always be inspired by his life and ideas. RIP. Apple’s focus on accessibility means all of its products carry technologies that help make them useful to everybody, even Apple Watch. One powerful technology is called VoiceOver. It tells people what is happening on screen and lets them control events with their voice, touch, or even a switch controller. Apple was the first to make a touchscreen accessible for people who are blind or low vision with the introduction of the VoiceOver on iPhone in 2009. Apple, of course, bucks that trend. In very simplistic terms, VoiceOver is screen-reading software that’s built inside all Apple’s products — you don’t need to pay more to use it. The software reads what you touch on the screen. So, you may move your finger around the Home screen on an iPad to find out what apps you have. It will provide you with information as it does — you’ll be told you are touching Mail and how many emails you have, or asked if you want to open the app with a double-tap. It can do much more than that, but the basic idea is that a person who can’t see well (or at all) can navigate and use their device, explore the web, read and write, and interact with items using the tech. 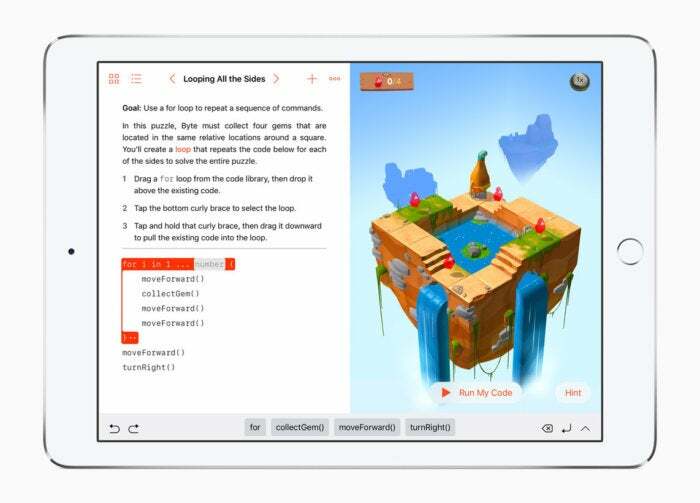 Apple’s VoiceOver works with Apple’s Swift Playgrounds app. To prove this, Apple worked with students at the Texas School for the Blind and Visually Impaired (TSBVI) to use VoiceOver and Swift Playgrounds to learn how to create code. And on Global Accessibility Awareness Day, the company announced plans to extend the course through eight Deaf/Blind schools across the U.S, starting in the fall. As the video below shows, this led to a student creating code with which to control a drone. I guess some readers may dismiss this as just another human-interest story, but it’s so much more than that. These students were able to use off-the-shelf Apple solutions to do something they may never have been able to do before (certainly not without additional and expensive equipment): write code. Students couldn’t see the drone, couldn’t see the iPad used to control it, and handled the entire flight using VoiceOver. The code they wrote did the job they wrote it for: It handled the take-off, the flight, and the landing. “It’s really cool because a lot of us [are] really good on computers and want to create apps, but there aren’t the tools,” said legally blind TSBVI student Demetria Ober, 18. Being able to do this enables those students who find they have an aptitude for coding to follow in the footsteps of Hawking (who among his multitude of achievements also wrote the Pocket Universe app) and create apps and develop ideas that may benefit everyone. It also opens up fresh career and personal development opportunities for those who can find a way to use an iPad, no matter if they are blind, visually impaired, or live with another condition. This may not sound so revolutionary to those of us sufficiently privileged to take these opportunities for granted, but when one in seven people around the world has some form of disability, such chances mean much more. Empowering one person empowers us all. “We see this as a way to get them interested in coding and realize this could open job opportunities," said Vicki Davidson, a technology teacher at TSBVI. "Apple has opened up a whole new world for kids by giving them instant access to information and research, and now coding." Apple updated the accessibility pages of its website on Global Accessibility Awareness Day. The company also offers regular Today At Apple accessibility sessions in its retail stores, where it will teach customers how to use the tools it provides and will today offer special in-store events at some of its biggest retail stores, including those in Cupertino, California; Austin, Texas, London; Cork, Ireland; Chicago, and New York. Apple Swift Playgrounds Resource guide (pdf): Includes information on VoiceOver. Macaccessibility.net: A volunteer-run podcast dedicated to providing access to the best resources for blind, visually impaired and other disability groups using Apple products. AppleVis: A community-powered website for blind and low-vision users. Cool Blind Tech: Assistive technology news and more. Updates: This story updated multiple times 5/17/18 as Apple announces plans to extend this scheme nationwide.